The new B Series Boats have a 94" beam width. 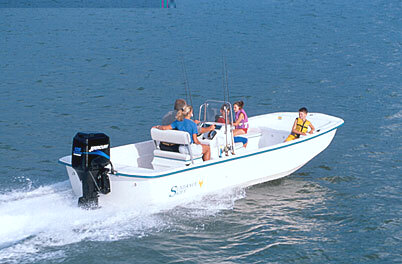 The B22CC uses a center console with no front seat and has custom built triple rod racks mounted on both sides of console. The B22CX uses a center console with a front seat and a dry box well under it and has 6 integral rod holders. We recommend using the CC Console and mounting the optional 72 Qt. igloo cooler with cushion in front of the console The consoles are set up for a top mount binnacle control. A 33 gal fuel tank is located inside the console with a fuel fill located on the port side of the console. The instrument panel has a fuel gauge, voltmeter and a tachometer. A space is provided for a 2" engine monitor gauge. We have added a Marinco stainless steel power point in the face of the dash. A four switch electrical panel, aerator pump and automatic bilge pump are standard. The panel circuits are now protected with press-to-reset circuit breakers. We have added wire conduits glassed into the floor to hull edge for ease in pulling wires forward for trolling motors and other electrical equipment. The steering wheel is a 15" stainless steel wheel coupled to a Teleflex No-Feed-Back helm. An excellent upgrade is the BayStar Hydraulic steering system. The custom molded lexan windshield and stainless steel console hand-rail are standard. The standard Front Deck is the Yacht Finish Front Deck which has a slick finished diamond non-skid surface and has 2 jump seats along the sides of the boats with flip cushions and extra storage. Front Decks have extra large hatches. The stern and bow light poles are stored in clips under the front deck. The B22 boats can be ordered with the commercial grade XL Front Deck which is fully glassed and integrated into the hull with a finish that matches the interior. The long rear deck has a 14 gal aerated live well with a high-speed pick up. The helm seat is a 76 Qt. insulated cooler with a seat cushion and a swing-back back rest.